Level – Moderate, you’ll need some basic familiarity with economics, politics, and history; Long (462 pages before acknowledgements, notes, etc.) overly repetitious and a bit tedious. As I start to write the review, it dawns on me that perhaps the title is a bit misleading. It isn’t so much about why they fail, as to why the never even get off the ground. Some nations seem doomed from the start, however, other become wildly successful. Ultimately, I think, the point of the book is who are the ones that are successful and how does that happen? 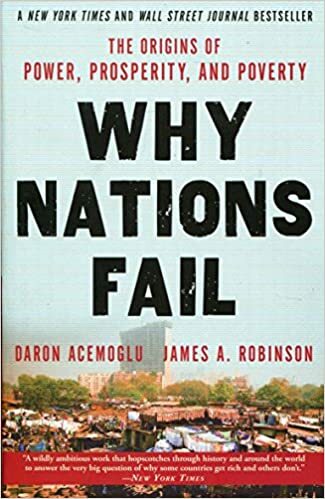 Acemoglu and Robinson pin it two factors, which taken with their opposites form something like a matrix or quadrant, and you need to overlap with the positive of both. These are whether or not you nation is politically inclusive and, and perhaps more importantly, the whether or not you have extractive institutions. The politic aspect is fairly straight forward, are you in a dictatorship (or other controlling, top down government) or in a democracy (or other form of responsive government)? If you have no say in politics, and government is controlled by a few or just one person, it is fairly easy to see why that wouldn’t work. The more complicated and impactful side is the extractive institutions. These can take many forms, such as contract law or heavy taxation, but a good example is property rights. If you know you have solid and secure property rights, you are more likely to invest and build up your business. If you fear that an institution may step in at any moment and take your land or business from you, why bother? The book itself is broken into 15 chapters, with an interesting preface about Mubarak and Egypt. The first chapter compares Nogales, Arizona and Nogales, Sonora; the two cities have similar culture and geography, so why is one rich and the other poor? 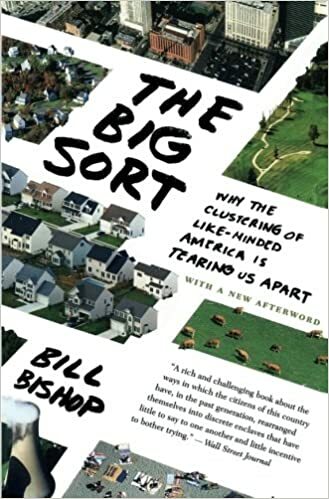 The chapter serves as the intro to the book and leads into the second chapter where the debunk the reasons for poverty being related to genetics or weather, among others. Chapters 3 through 12 are basically case studies where the authors look a different political situation throughout history through the lenses of responsiveness and extractiveness. In 13 and 14, the authors discuss nations that fail today those that have become successful. The final chapter looks at our attempts to help impoverished nations and how understanding the causes, as the have proposed, will help us to better understand why those attempts have failed and how we can do better going forward. First, about the book itself – the authors are both academics, and the book certainly reads that way to an extent. The book could have been much more concise, dropping at least 100 pages without missing any case studies are points. I think part of the issue may come from the publisher/editor, in that instead of setting up most of the chapters as case studies that then looked at their points each time, it might have been better to make their points, and then touch on case studies as proof. Instead, each chapter could almost be read independently, meaning there is too much repetition of their point. To the content of the book – it was fascinating, anyone with interest in economics, history, or politics, this book is a must read. One of the the more interesting points of history to me, was the impact of the Plague on serfdom in Europe. Eastern Europe reacted one way, England another, which would then impact America (as it was founded with this change as part of history), which ultimately effects me today. Had the reaction in England been the same as the Austria-Hungary reaction, who knows how different the Western World would look, perhaps I wouldn’t be writing this review right now. Another point the spend some time on that is worth considering is looking beyond just economics. The point to growth of the economy under Stalin, but that the nation still failed. It is also helpful to see and understand how the impacts of colonialism, which was not inclusive but very extractive, still effects those countries and peoples today. The point was driven home a little more for me because I live in the South, which they actually spend some time on. The impacts of slavery on the economics of white people is still being felt today, though less so than a few decades ago. The discussion centers on the fact that obviously slavery is extractive and was horrible for black people, but it also never would have worked politically because it included so few people in the institutions. Most white people were shut out of the economy and wages and this impact lasted a long time. They point out the that median income in the South was about 40% of the median income through the rest of the nation as recently as 1950. All of this works back to a reminder that part of why life is good for me today is pure luck. From serfdom in England, to the Civil War, on through today. If Lincoln had let the South succeed and be it’s own country, it clearly would have failed, based on the theories of the authors. Meaning, I could be living in a failed state right now, instead of America. They call it ‘small differences and critical juncture’ in history, but it is basically an accident of history; it is somewhat sobering to consider. Overall, and interesting and challenging book. It could certainly be a bit shorter and cleaner, which is why I didn’t rate it higher, but a book that is well worth the read and one to put on your list.